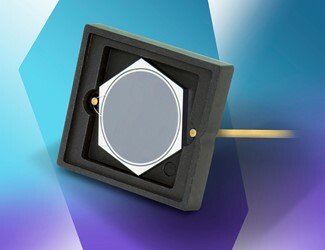 The AXUV20A circular photodiodes feature shunt resistance is 100 MOhm, a typical reverse breakdown voltage of 5 volts, and a 4 nF typical capacitance, and a rise time of 2 µsec. The AXUV series of photodiodes exhibits response to electron energy levels as low as 100eV. Operating and storage temperatures range from -10 °C to +40 °C in ambient environments and from -20 °C to +80 °C in nitrogen or vacuum environments, and the device is shipped with a protective cover plate. For additional features and specifications on the AXUV20A Series of photodetectors, download the datasheet.